Contents: Part I Special Section: 'European Shakespeares', Edited by Ton Hoenselaars and Clara Calvo: Introduction: European Shakespeare - quo vadis?, Ton Hoenselaars and Clara Calvo; The chore and the passion: Shakespeare and graduation in mid-20th century Portugal, Rui Carvalho Homem; Henry V and the Anglo-Greek alliance in World War II, Tina Krontiris; Asian Shakespeares in Europe: from the unfamiliar to the defamiliarised, Alexander C.Y. Huang; Rearticulating a culture of links: Peter Brook's European Shakespeare, Fran Rayner; Shakespeare uprooted: the BBC and ShakespeareRe-Told (2005), Clara Calvo and Ton Hoenselaars; The anti-Americanism of EU Shakespeare, Douglas Bruster; Shakespeare and France in the European mirror, Jean-Christophe Mayer. Part II Shapes of Character: Man's chief good: the Shakespearean character as evaluator, Mustapha Fahmi; 'I have no other but a woman's reason': folly, femininity and sexuality in Renaissance discourses and Shakespeare's plays, Paromita Chakravarti. Part III Shapes of Romance: Shipwreck and ecology: towards a structural theory of Shakespeare and romance, Steve Mentz; Great miracle or lying wonder: Janus-faced romance in Pericles, Tiffany J. Werth; 'Better days': cultural memory in As You Like It, Indira Ghose. Part IV Review Essays: (Re)presenting Shakespeare's co-authors: lessons from the Oxford Shakespeare, Tom Rooney; Inventing the human: brontosaurus Bloom and 'the Shakespeare in us', Laurence Wright; Bibliography; Index. Graham Bradshaw is based at Chuo University, Japan. Tom Bishop is based at the University of Auckland, New Zealand. David Schalkwyk is a Professor of English at the University of Cape Town. 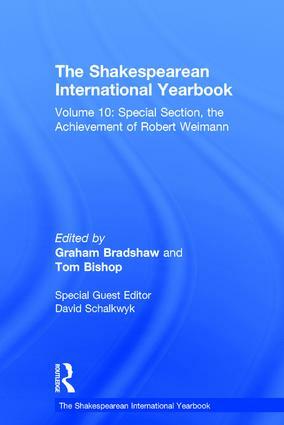 The Shakespearean International Yearbook surveys the present state of Shakespeare studies, addressing issues that are fundamental to our interpretive encounter with Shakespeare's work and his time, across the whole spectrum of his literary output. Contributions are solicited from among the most active and insightful scholars in the field, from both hemispheres of the globe. New trends are evaluated from the point of view of established scholarship, and emerging work in the field encouraged, to present a view of what is happening all around the world. Each issue includes a special section under the guidance of a specialist Guest Editor, as well as a production diary or record of a notable Shakespeare performance. An essential reference tool for scholars of early modern literature and culture, this annual captures, from year to year, current and developing thought in Shakespeare scholarship and theater practice worldwide.